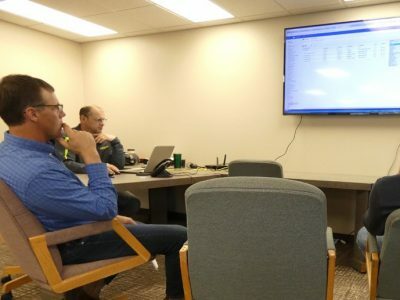 Countless conversations with farming friends, focused on the difficulty of dealing with data tracking, led a group of local farmers and ranchers to come up with an ag business solution. Jon Richter ranches West of Linton and is also the owner of PlainsMobile Inc, a cloud based business solution company. His team was hired by a local group of farmers to build AgCinect. Our technical team created AgCinect based on the design and use feedback from our partners. “The main problem when talking to local farmers and ranchers, was there were multiple programs needed to track their data. This was costly especially if purchasing a field management program, and these solutions didn’t meet all of their needs. With all the feedback from the AgCinect investment partners, we continue to improve the overall business solution on a daily basis” Richter said. We recognized there are separate products for feed lots, calving, field management, and accounting. These products do not integrate so at any time of the year, the farmer and/or rancher does not have accurate analytics to measure their operation” Richter said. AgCinect gives farmers and ranchers a comprehensive solution to manage the data for their full agriculture operation as it combines programs ranging from calving books to financial programs. The platform serves as a one-stop-shop for tracking all types of data on an agricultural operation. For cattle operations, ranchers are able to keep track of groups of cattle by customer pot, age, and pen. Feedlot owners also have the ability to keep track of how many pounds of feed are used daily, doctoring fees, daily yardage, and headcount across different entities. At the end of month, they can automatically print and/or email invoices. All ranchers have to do is enter inputs into the system once a day, and the data is stored and used in various ways to give them valuable feedback and automated invoices. This gives ranchers the ability to see what is working and what has room for improvement. On the calving side, ranchers can enter a new calve in seconds and take notes on their production herd to manage future culling. You can enter doctoring records to keep track of sick calves. In operations where multiple people handle calving, data cubes provide critical information on health issues in the herd. AgCinect is a multi-user cloud solution so all individuals (if granted access) have secure access to the data in the operation. “Our solution is 100% mobile friendly as well, so ranchers can enter calving and feed lot records in seconds on their phone. We make data entry as quick and seamless as possible” Richter said. On crop operations, farmers can measure specific inputs from seed to sale on a crop lifecycle, and can see exactly how much they profit off each acre and each crop type. Not just this year, but as far back as data is entered. Historical records allow for an overview insight of operations to help with future planning and past analysis. Access to this data gives the visibility to see exactly what was lucrative and ultimately what worked for the farmer and what didn’t. The program also can help both farmers and ranchers track the expense, usage, or depreciation of individual equipment used with respect to specific projects. Andrew Vetter runs a custom feedlot, has a cow-calf operation, and is a crop producer East of Linton. He said he has been looking for a program like this for a long time, and he is hoping it can help him save time and eliminate errors that might be made when moving numbers from one program to the next. I also plan to move my expense and sales information from Quicken to AgCinect which will allow me to keep my data in one solution. With all my data in AgCinect, I will be able generate accurate financial statements and track profitability anytime during the year. “At the end of the year, it takes hours upon hours to move numbers, in order to give me what my income was for each part of my operation. I think this could really be a big help,” Vetter said. Customers who have been using the product say it has done exactly that. Chris Zenker and his brother Mike, who own a multi-entity ranch near Gackle, ND agree that having AgCinect has made their partnership more seamless. “Being able to track all of your information on your fields, all the way from input to harvest, then being able to use the data to analyze what worked and what didn’t, especially in a multi-partner operation, has been great. I can generate accurate reports which tell me our specific input costs by farm partner.” Mike said. “The fact that you can see exactly what you put onto each field from previous years is really helpful in planning for upcoming planting seasons,” Chris said. “Most industry software, is simply “use-as-is.” In our program, if there is a feature that isn’t implemented and a producer would like, we can add it, sometimes in a matter of hours. We enjoy hearing what can be added or changed, and our mission is to improve the life and business success of the farmer and rancher.” Richter said. All of the data entered is securely stored in the internet cloud, which is the standard for modern business solutions. This also means the data is accessible from any device, whether that be a phone, tablet, or computer. AgCinect has also recently partnered with Climate FieldView. The partnership will allow customers of both products to be able to seamlessly move data from one program to the other. “We are extremely excited about our partnership with Climate FieldView. With FieldView, all planting, spraying applications, and harvesting events will automatically be captured in AgCinect. The farmer will not have to manually enter their field information. We are currently very busy building the technical integration, and also educating the Monsanto sales channel on AgCinect. To find out more visit www.agcinect.com, or call (888) 627-1798.